The Sunningdale Summerhouse is one very smart looking and well made small summer house. 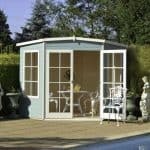 This is a good sized summerhouse that despite its compact dimensions actually offers you a lot of room to make use of. A home office, playroom, gym or just a place to enjoy a meal and a glass of wine are all things you could use this for. The design of this summerhouse is a great mix of the new and the old and the summerhouse has a modern design, but it is finished off with some antique style fixtures. 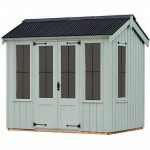 This is one very attractive looking summerhouse, but it is also made with some very high quality materials. The walls are made with some very smooth 12 mm thick tongue and groove shiplap cladding. This is then backed up with a frame that is very thick and long lasting. Inside the summerhouse tongue and groove boarding is used for both the roof and the floor which makes them strong and also fit in with the style of the rest of the summerhouse. Including the ones on the double doors, there are an incredible eight windows on this summerhouse, all of which are made from high quality toughened glass. Wow was what we said the first time we saw images of the Sunningdale Summerhouse. This is such a classy looking structure, it has a kind of pool house/ sauna type of look to it and we really like that. The shape and design of this small summer house is very modern and we are sure this is going to make it popular with people who want something a little bit cooler. This may be classed as a smaller sized summerhouse, but it still offers you a decent amount of space. The width is 8 feet and the depth is 6 feet so you do have quite a bit of room inside here. If you look closely at the picture you can see that they have gym equipment in there so that tells you that you have a good amount of floor space to make use of. The height of this summerhouse is something that really impressed us as at its lowest point it is 6 feet 3 inches high. At the front which is the highest, you have over 7 feet of headroom. For the roof they have gone for a pent roof, but this is one of the steepest pent roofs we have seen and it looks amazing. The roof has a rather large overhang which is going to give the front of this small summer house a bit of protection. The roof is made from some very high quality boarding that fits the design of the rest of the summerhouse very well. Covering this is some mineral felt which will keep the rain from damaging those boards. The Sunningdale Summerhouse has some gorgeous redwood cladding. This is 12 mm thick tongue and groove shiplap cladding and it has a very smooth and sleek look to it. This cladding is very well made and it is pretty much impossible for rain to sneak its way in through it. Also at 12 mm thick it is also very strong and will be able to deal with a bit of abuse over its life. 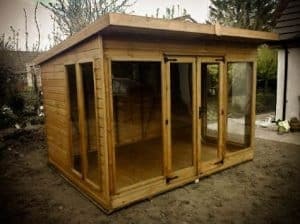 One of the things that is going to ensure you can use this small summer house for many, many years is the frame that they have used inside it. The framing is 34 mm x 34 mm thick so it keeps the structure solid and not flimsy like some cheaper summerhouse can be. We know that the frame is not the most exciting thing to talk about, but you will be happy to know that it will just be there doing its job, keeping the summerhouse solid. Look at the pictures and you can see the lovely tongue and groove boarding they have used for the floor. We really like this as first of all it gives the inside of the summerhouse a real uniform look as it goes very well with the wall cladding and the roof, but this kind of flooring is also very strong and able to take an incredible amount of weight. 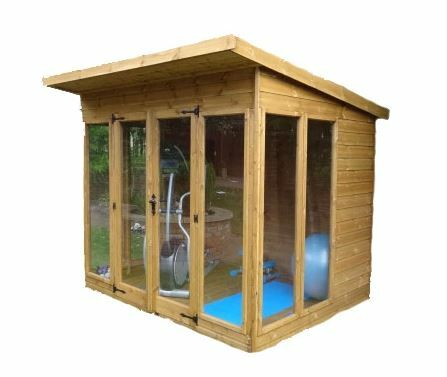 The Sunningdale Summerhouse is one very smart looking summerhouse and while the cladding is thick as is the framing behind it, you will need to give it a little helping hand to ensure it stays looking good for the duration of its life. 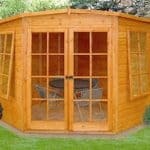 Once you have installed this summerhouse, you will want to give it a good coating of wood treatment. This should then be reapplied once a year. It is not much work at all and it will keep the summerhouse free from rot. For some odd reason there is no indication of what kind of warranty you get with this small summer house. At the very least you are looking at a year, but most summerhouses like this come with a 5-10 year anti rot guarantee as long as you look after the wood properly. Just be sure to ask them about the warranty before you order. The doors on the Sunningdale Summerhouse are great. They have used large double doors that offer you plenty of space to get in and out of the structure. The windows are comprised of some thick framing and glass windows. One of the best things about the doors is the way the door handle and the hinges are not modern like the rest of the structure, but instead they have gone for antique looking ones which actually goes really well with the rest of the summerhouse. This summerhouse has an incredible amount of windows. As well as those two on the doors, the front has another set of large windows on each side of the door. Each side of the summerhouse also has another two large windows. Natural light is really going to beam inside of here thanks to the vast amount of windows. All of the windows are made with toughened glass which is great and helps make the summerhouse and even more robust structure. This is actually a very secure small summer house as the doors come with a proper lock and key. We feel that this offers more than enough security and you will feel more than comfortable leaving more expensive items inside of here. We love the large windows that are on the Sunningdale Summerhouse, but as most of the front of this structure is covered with windows you really are not getting much privacy at all. You could always use blinds or curtains, but we feel the open look of this is one of the things that make it stand out from the other summerhouses. If you want to give the summerhouse a bit of colour then think about using a coloured wood treatment. They actually offer wood treatment in a number of colours here such as Red Cedar, Golden Brown and Holly Green just to name a few. These can be purchased for £24.95 each. Let us say right away that we feel the standard version of this small summer house is great and that it is fine the way it is, but there are a number of upgrades that you can purchase. You can add a set of floor bearers for what we consider to be a fair price of £46. We think the cladding is fine, but it can be upgraded to 18 mm thick premier cladding for £204, 15 mm loglap cladding which costs £204 and 15 mm tanalised cladding for £285. They also offer upgrades to the framing where you can go for super heavy duty 44 mm x 70 mm framing for a cost of £255. Lastly, they have an installation service, which at £68 is one of the fairest prices for an installation service we have seen. This is one very high quality small summer house. Honestly while it has lots of upgrade options, we feel that the way that it is as standard is very high quality. You are going to be able to enjoy this for many, many years. It has been designed very well and all the materials have been chosen because of their longevity. As long as you look after the cladding, you will get at least 20 years out of this. We know that 8 X 6 does not sound huge, but this is one of the bigger, compact sized summerhouses we have seen. The floor space if used right can go really far so have a think before you start putting things inside and you will be amazed at how much you can fit in here. One thing we really like about this is how they have designed it so that you just need basic tools to install it. You will need another person to help, but installing this should not cause you any problems at all. 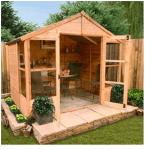 We really like this summerhouse and while it does cost over a thousand pounds, we feel that the asking price is just right, considering the materials they have used. Final Thoughts: The Sunningdale Summerhouse is a small summer house that impressed us from the first moment we saw it. The design is just so cool that it is impossible not be impressed by this. Even smaller gardens will be able to house this and despite its compact dimensions. It does still give you a good amount of room to use. We love the way they have used so many windows and the fact they are made from toughened glass is a very nice bonus. 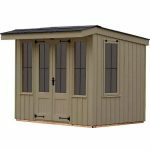 We know the price is certainly up there, but this really is one of the most high quality smaller sized summerhouses we have seen in quite a while.